So I bought a helmet. 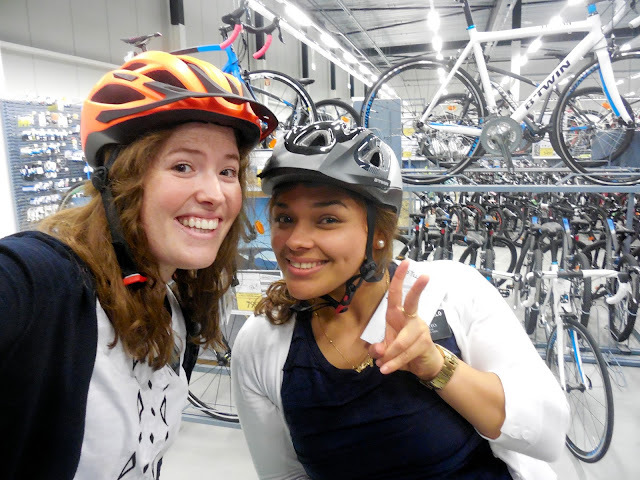 We traveled an hour to find a huge sports warehouse called Decathlon that had helmets on sale for 10 euros. We got back to the station to hop on our bikes and put on our helmets and almost died from laughing so hard. I tried to leave the tag on so it looks like it´s a joke, but it gets pretty windy here :) The looks we get from people are priceless. If you ever want to get some Dutch people to laugh or stare at you just buy a helmet for 10 euros and wear it around town :) It is the best though because we just laugh and smile and have the best time on our bikes now. Mom the Editors note: The Dutch people don't embrace wearing bicycle helmets... and the Missionaries have not been required to wear them in this Mission... until now. The policy was reviewed and now each missionary is required to wear a helmet. Hence the giggling and brave smiles... and new helmets. Saturday was real good this week though. We met up with the District Leaders and went to teach a lesson to J. our favorite 74 year old man. We taught him about The Plan of Salvation and it was a really powerful lesson to be able to talk about our purpose in this life. His wife passed away a while back and he is just a super old man that wants to develop a relationship with God. He was happy to have 4 missionaries there, and we were all able to bear such a powerful witness of Jesus Christ's role in the plan of Happiness. We committed him to coming to church the next day. When we went to pick him up for church, he said he had slept in... but we're hoping that he comes next week! Grapje moment- as we were walking out, the Elders were in the other room and J. whispered to me in a most serious voice- "Is hij jouw vriendje?" (Is he your boyfriend) I died laughing. Interviews were soooo good though. 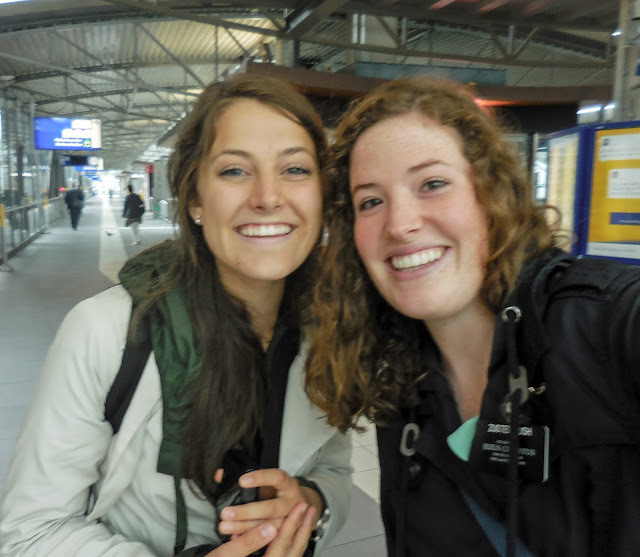 President and Sister Bunnell are a dream and are so dedicated to this mission already. A lot of the interview was just getting to know and asking questions about my life and how I get along with my family, but one question that really stood out to me was when President asked me how my relationship is with my Father in Heaven. It really struck me that out of everyone I have met on my mission and everyone I know in my life, Heavenly Father is the most important. That is one big lesson I am trying to learn on my mission. I need to please Heavenly Father instead of trying to always please people. As I love my Heavenly Father and do all I can to serve him, He will help me to have enough energy and love for the people around me. I finally got to work with Zuster Watts for a day! She is my sister training leader and came down to Breda. It was so weird that we could actually speak Dutch and semi know what we are doing now. We went to visit a less active who lives in a retirement home, and the front desk let us in and told us she was sitting at one of the tables waiting for her lunch. As we were walking towards the cafeteria there was this adorable little Indonesian lady with maroon hair waving at us. She was so happy to see us because he hadn't been visited by the missionaries for a long time. We only stayed for about 15 minutes but she was so happy to have us there. I pulled out one of my favorite scriptures in 2 Nephi 22:1-6 and read it to her and she was in tears. She has really missed the Book of Mormon and wants it back in her life. She was the sweetest lady and helped me to remember how much joy I find from the knowledge of my Savior Jesus Christ..
Zuster Jaramillo and I are having way too much fun together. She is the sassiest most hilarious Aruban I have ever met. She´s the first Aruban I've ever met but probably will stay my favorite :) We have fun cooking lots of food together and she has fun scaring me multiple times a day. Yesterday she freaked me out when I came out of the bathroom and she got it all on camera. Literally 5 minutes later she did it again while I was brushing my teeth. Pretty soon she´ll have an entire film. That´s about it for this week! It´s finally getting hot here again and everyone is coming and going for vacation. I love you all! I feel so blessed to have such a big family strong in the Gospel of Jesus Christ and also so many friends out there doing what I am doing. Whether you are on a mission or not you can still be an example to those around you by just loving people! P.S. My One Year mark on Thursday. Whaaaaaaaaaaat. We are all freaking out over here. I don´t believe it.